In this section, we’ll create the ground for our bamboo scene. To begin, resize your document. The Document palette contains everything to control your document’s basic properties. This includes its dimensions, background color, and border color. The Proportional button keeps the relative dimensions of your document the same. When it’s active, adjusting the width will also adjust the height and vice versa. Since we want a canvas that is wider than it is high, we need to disable this feature. Click Resize, and then say OK to the confirmation dialogue. We’re creating a document that is considerably wider than it is high. In addition, we’re creating it at twice the actual size that will be exported from ZBrush. This will provide us with very clean, antialiased edges when we do our final render. Working at a larger canvas size also makes it easy to add extra detail. In the Initialize menu, set V Radius to 40. All native ZBrush objects ending in “3D” are parametric tools. This means that you can modify the object by changing several parameters associated with it. All of these parameters are found in the Initialize menu, and will vary from object to object. In the case of the Plane3D object, we have settings for its width and height, as well as for its resolution. Since this plane will provide our background, we’re setting the V Radius so that the object’s dimensions are similar to the canvas dimensions. Draw the plane on the canvas, and then press T to enter edit mode. Rotate the plane a little. From this angle, it will be easy to see the effects of the deformations that we’re about to perform. This particular alpha has a bumpy sort of appearance. It will make it easy for us to transform the plane into bumpy ground. This applies the alpha to the plane as a mask. You’ll see that the plane on the canvas now has a grayscale pattern that matches the alpha. Masking applies to a model based on its polygons. Since we have relatively few polygons at this point, the masked pattern is blocky. That’s ok for our purposes. Open the Tool:Deformations menu. In the offset slider, make sure that only Z is active. Each deformation has X Y Z settings. These correspond to the model’s coordinate system. By turning off X and Y, and turning Z on, we’re telling ZBrush to apply the deformation only along the model’s Z axis. In the case of the plane, that means the flat side. If you ever want to know what the model’s coordinate system is, open its preview. X will be horizontal, Y will be vertical, and Z will be the direction pointing directly toward you. All deformations operate along the coordinates seen in the preview, which will not necessarily match the scene’s coordinate system. In the Offset slider, enter a value of -20. 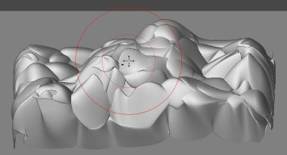 This tells ZBrush to offset points, creating raised bumps. A value of 100 is equal to 1 ZBrush unit, so -20 is equal to 1/5 of a ZBrush unit toward the preview camera (+20 would have been away from the camera). The offset is restricted by the masking that has been applied to the model. Areas that are completely masked (dark gray) won’t be offset at all. Areas that are completely white will be offset the most. By combining masking with deformations, it is truly amazing what can be created from the primitive 3D objects! Turn off Quick 3D Edit on the top shelf. Quick3D disables ZBrush’s smoothing routines. This allows a model to render faster while you work on it, but it also makes the model appear angular. By turning Quick3D off, we are telling ZBrush to render many polygons for every real one. This results in a much smoother model. Your model should now look something like the image above. It still has a checkered pattern caused by the masking. Press Tool:Masking:Clear to remove the mask. Now that the model has been deformed, we no longer need the mask. Do an Inflate deformation at a value of 100. Since the masking has been removed, this deformer now applies to the entire model. Every point gets moved by this deformer according to its surface normal. This has the effect of inflating the features. Here we have the results. The bumps created by the offset deformation have now been inflated to create a surface that is ideal for our needs. In the Transform:Modifiers, turn off Xyz. Then change the X Y Z switches beside it so that only Z is active. Normally, when you sculpt on a mesh your editing tool will affect the model in all three directions. What we want to do next will be to only sculpt depth details into the model. These settings will force ZBrush to only sculpt along the Z axis. Now sculpt some extra depth onto parts of the model by simply drawing on it. Create a higher area in the center of the mesh, with a few other bumps surrounding it. Whenever you click the mouse, the model will temporarily become very angular. This is because ZBrush needs to switch back to Quick 3D Edit while you are applying an edit. As soon as you release the mouse, ZBrush switches back to the rendered view, allowing you to see the finished results of your work. Now use the move, scale and rotate features to fill the canvas with the ground that you have sculpted. The canvas should now look something like the image above. You may find that you need to switch to the AA Half zoom level in order to be able to see the entire canvas. From the Materials, select NoisePattern1. Use the color selector to choose a yellowish-brown color. Even though the object has been converted to pixols, a copy of it remains as polygons in the Tool palette until the end of the ZBrush session. You could therefore save it for use in another scene or clear the canvas and redraw it if you decided that it needed further sculpting on a polygonal level. Press T to exit edit mode and return to normal draw mode. Since the ground is placed how we want it, and has had material and color assigned, we no longer need to keep it editable. At this point, we can convert it from a 3D object made up of polygons to a 2.5D object made up of pixols. This gives us much more room for creative freedom than polygons could offer, with the trade-off being that the object will no longer be able to be picked up from the canvas again. This is very close to what we want, but too shiny metallic-looking to be ground. We can remedy that by changing the material’s modifiers. Pull down the Material palette and change the Specular setting to 30. The canvas will immediately update to reflect the change. This is because materials remain “live” on the canvas, even after the model has been snapshot. While we’re at it, let’s change some other modifiers for a more dramatic effect. Set Noise Radius to 45. This increases the scale of the noise pattern. Set Color Bump to -5. Color bump tells the rendering engine to make a surface appear less smooth based upon its color values. With a negative value, darker areas will be raised. In this case, that gives the appearance of smooth stone with dirt caked on top of it. Edit the NoiseCurve to match the image below. Once you have created the overall pattern, you can fine tune it with its Focal Shift slider. What we want is for there to be a few lightly-colored smooth areas, surrounded by lots of caked-on grunge. From this point forward you might prefer to work with the AA Half zoom level active, and only switch to full size when precision is required. This will allow you to work with the image as it will actually be seen when complete. When finished, you should have something like the image above. Select the Simple Brush tool, select alpha 8, and the Spray stroke type. These settings combine to create a randomized spray paint effect using the selected alpha and variations of the current color. On the top shelf set a Draw Size of 80, and an RGB Intensity of 50. We want our new color to blend nicely with the existing canvas color, which is why the intensity is set where it is. Now paint a few strokes on the canvas to break up the pattern created by material. First, select the FastShader material. We change to a different material because otherwise the strokes that we’re about to paint would blend too much with the existing noise pattern material. Select alpha 23, and set the RGB Intensity to 100. In the Stroke palette, change Placement to 100 and Color to 100. A high placement setting will give the maximum scatter as we paint our strokes. A high color setting will cause the greatest randomness in color variation while we paint. Changing colors to yellows and greens, paint a few random strokes across the canvas. The random effects of the spray stroke give us the look of mosses and other stuff growing on the rocky surface. The effect is very realistic. Save your work using Document:Save As. If you wish, you can also save your ground plane as a 3D object using Tool:Save As. Always remember that saving your document saves the pixols that are on the canvas. It will not save any models as 3D objects. To save them, you MUST use the inventory controls in the Tool palette. Saving the document also saves any materials that are in use on the canvas. We therefore have no need to save them separately unless you would like to use the ground material again in another project. If you do, then select the NoisePattern1 material again and press Material:Save. In this section we have seen how deformations and masking can be used to transform simple parametric objects into much more complex models for use in your ZBrush scenes. We’ve also experimented with materials and the Spray stroke type to mimic the randomness of nature with hardly any time or effort. In the next section, we will incorporate more 3D elements into our scene.